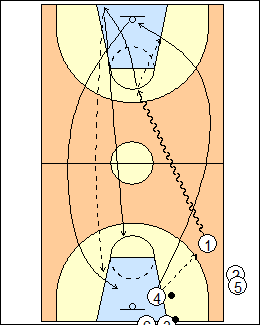 4 passes to 1, who speed dribbles upcourt and jump stops inside the three point line, 4 sprints up the sideline, gets a pass for a no-dribble layup then sprints to the other end, 1 inbounds long to 4 (outlet on a miss) for a no-dribble layup, 1 sprints to rebound the shot and give the ball to the next player in line. Use two balls. See Layups - Celtic, Fast break - Outlet and go.